This pets wooden knob puzzle by Educo is a fun beginner puzzle perfect for all babies and toddlers. All your favorite family pets in one delightful puzzle! 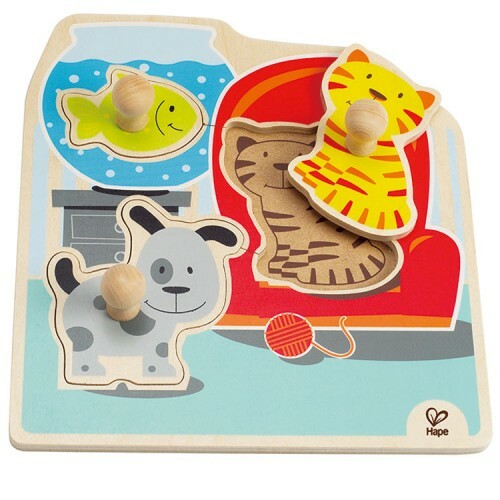 The My Pets Knob Puzzle by HaPe is a fun beginner puzzle perfect for all babies and toddlers. Featuring chunky animal shaped pieces and a sturdy wooden frame, this Educo puzzle is durable and adorable. Each puzzle piece is colorful and easy to grasp with a handy knob attached. Featuring a cute doggy, kitty cat and goldfish, the My Pets Knob Puzzle from Educational Toys Planet is whimsical and educational. Children will enhance fine motor skills and dexterity as they piece together is exciting puzzle. Can you match all the pets? Dimensions of package 8.19" x 8.86" x 1.6"
Write your own review of My Pets Knob Puzzle. Rating: 5 Best Christmas present! by Hape Toys What a hit! This was given to my then 10 month old for Christmas and he’s still playing with it every day a month later! It’s sturdy and cute. None of the paint or wood has chipped and it looks like new and my little one is very hard on this puzzle. It gets chewed on and banged together loudly daily. We will buy more of this brand. Very impressed with the quality. Perfect size for little hands. Rating: 5 great puzzle for littles by valbrita i bought this for a one year old. perfect size, sturdy, colorful and fun for baby or toddler.